First I want to say that I throughly enjoyed this book. I also believe strongly that some books are even better when you listen to the audio version. Especially with a good voice talent reading. I listened to this while making breakfast for the boys, working in my craft room, and even while sitting at pick up waiting for the boys to come out of school. I read this book always keeping my experience of losing my mother close to my heart. My mother had a deep love for books and always encouraged me to read. We didn’t have a book club where we always read the same books but we shared what we were reading. So Will’s mother, Mary Ann reminded me so much of my experience with my mom. My mother could never get enough of books and read them even when she became ill and we took turns reading when she wasn’t feeling well. Books were prominent in their lives as in my own. I enjoyed how the chapter titles were titles of books. 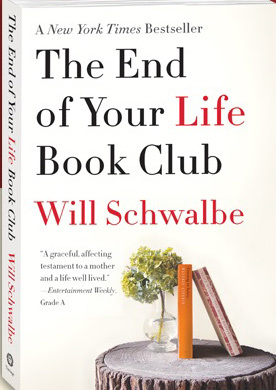 Schwalbe really captured the essence of life and life with a loved one dying (or should I say living) through books. They formed their book club with mother and son using books to navigate the delicate balance of living. It was also a remarkable tribute to his mother and the relation they continued to develop right up until her death. I laughed at some points and paused to cry in others because I can relate to many of the feelings he had while going through this experience. There was a funny part about elevator etiquette that I can’t stop laughing about. But you must read it to find out. I was thrilled when I heard them mention books that I read and I also found myself adding more to my TBR list after listening to their analysis of books. I think that this a great book for everyone. It’s about the joy of reading and reading with others. Books can bring you places your feet and heart might not often travel. This book can open you up to new adventures with books you may not have thought about before. It helps you understand the importance that books play in our lives. They aren’t just for passing time. I thoroughly enjoyed this book. My rating was 5 butterflies!